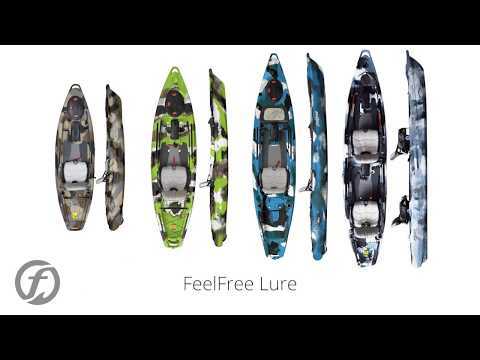 The Feelfree Lure 13.5 Overdrive features the modern evolution of pedal powered kayak propulsion offering effortless speed, ease of use and adaptability. It features a one-handed rudder steering lever control and Gravity seat adjuster for the ultimate in accessibility and comfort. Engineered to last, the system is manufactured using cast aluminum and finished off with heavy-duty components. The Lure 13.5 with Overdrive pedal drive also features a large bow hatch, front console, Gravity seat, and rudder with hand steering control. 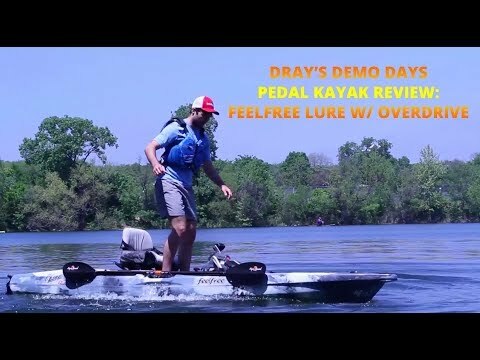 Paddle, pedal or power, the Overdrive system gives kayak anglers and recreational paddlers the flexibility to Feelfree all day long no matter where they choose to have fun! The lid has an inlaid cutting board for prepping bait or cutting fish and is insulated so the console can be used with the optional cooler insert to keep your drinks, bait, or fish cold. An integrated transducer recess and port make for easy installation of a fish finder. The Lure 13.5 still includes all the other great feature of the Lure family like the removable multi-level, multi-position extra wide Gravity Seat, Feelfree's wheel in the keel, and Uni-Track system. this thing is amazing. i upgraded from the ascend 128t . and wish i had this to get go from start. if you have back problems like me the pedal drive is a life saver on ur back. stable this thing is unreal stable , i could stand straight up and fish with out even tetering like walking on boat deck. this thing is awsome worth every dollar so many pros to many to list best fishing investment i ever made. Q: How well does this do offshore? A: This Kayak works beautifully inland and offshore! Q: Which kayak allows for a longer legs when pedaling, the FF Lure 13.5 or the Old Town Predator PDL? A: Hello, the Old Town Predator PDL is going to provide the most leg room while peddling. You can contact us at 888-828-3828 if you have anymore questions or would like to place an order. Q: Hi I have seen pictures of this on the web in neon orange. Do you carry it in neon orange? A: Unfortunately, we don't carry a neon orange for this kayak. Q: Does the Feelfree Lure 13.5 with Overdrive have a factory installed way of running battery cables through the hull so that they're hidden to an Overdrive Motor if I choose to install one or will the cables need to be exposed? A: The Lure 13.5 does not come with factory installed battery cables. Feelfrees' installation guide includes how to hide the cables in the hull. So that they won't be exposed but you will have to install them. Q: Does the rudder come pre installed on this kayak ? A: Yes, the rudder does come pre-installed from the factory. Q: Get you use the sonar pod with the pedal drive? A: The sonar pod will fit this kayak, but it cannot be used in conjunction with the pedal drive. It replaces the pedal drive when you want to just paddle.